Updated June 24, 2014, 11:58 a.m. EDT: Meriam Ibrahim has been detained at the international airport in Khartoum, Sudan—the country's capital—while she, her husband and two children were attempting to leave the country, according to her lawyer, Mohaned Mustafa El-Nour, the Daily News​ reports. “They knew she had been cleared by the court, but they have rearrested her,” another lawyer, Elshareef Ali Mohammed, told NBC News, according tothe Daily News. “I don’t know why.” It is unclear why Ibrahim is being held or if new charges have been made against her. 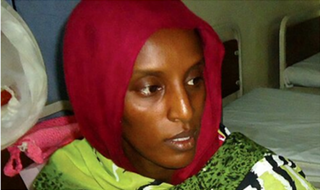 Meriam Ibrahim, a Sudanese woman raised by her Ethiopian-born Orthodox Christian mother, was slated to be executed for converting to Christianity, but now she has been set free by the Court of Cassation in Khartoum after a ruling Monday, reports New York’s Daily News. The 27-year-old mother of two was convicted of apostasy in May for marrying a Christian man in 2011. Ibrahim, who is considered Muslim because of her paternal side, broke Shariah law. Adopted in Sudan during the 1980s, it prohibits Muslim women from marrying non-Muslim men and requires that children adopt their father’s religion. Raised in an Islamic environment, Ibrahim’s brother, a Muslim, filed the complaint against her, according to Sudanese Parliament Speaker Fatih Izz Al-Deen, reports CNN. When Ibrahim refused the court’s order to renounce her religion, she was imprisoned and sentenced to 100 lashes and then death by hanging, CNN reports. Ibrahim’s case drew international attention and outcries on her behalf from human-rights groups and foreign embassies. The U.S. State Department reacted to the sentence in May, saying that it was “deeply disturbed,” reports the Daily News. Authorities initially granted Ibrahim a stay of execution because she was eight months pregnant with her second child, with the duration of the stay set to last long enough for her to nurse her baby postdelivery, according to Amnesty International, the Daily News reports. Ibrahim gave birth to a girl in May while in a Sudanese women’s prison. Ibrahim’s first child, who is 20 months old, also stayed with her in prison because her husband, Daniel Wani, who uses a wheelchair, is battling muscular dystrophy and “totally depends on her for all details of his life,” according to Ibrahim’s lawyer Mohaned Mustafa El-Nour, who noted that Sudanese officials said the toddler was free to leave the prison at any time, reports CNN. Ibrahim was reunited with her husband after her release from custody, according to El-Nour, reports CNN. El-Nour said that an appeals court found that the initial judgment against her was faulty, CNN reports. Other cases like Ibrahim’s have emerged in recent years, but in each case, the convicted person escaped death by denying his or her faith, reports the Daily News. Read more at the Daily News and CNN.